The prototype of Bus Roots. Photo by Bus Roots. New York University student Marco Antonio Castro Cosio developed a playful design of a bus with a “green roof,” aimed at rethinking quality of life in the city. 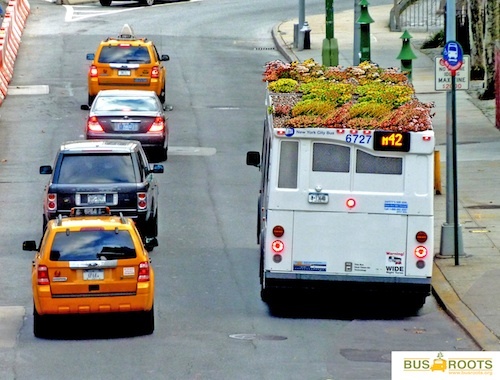 The designer, who attends the Interactive Telecommunications Program at the Tisch School of the Arts, said the goal of the “Bus Roots” project is to reconnect “urban communities with nature in a practical and playful way” by utilizing the forgotten spaces of bus rooftops. The roaming Bus Roots garden in action. Photo by Bus Roots. A New York City public bus has a surface of 340 square feet, Castro says, which means that the Metropolitan Transportation Authority’s fleet of about 4,500 buses is an opportunity for 35 acres of growing space. A prototype of the bus was installed on BioBus, a mobile laboratory for students in schools with limited science facilities. 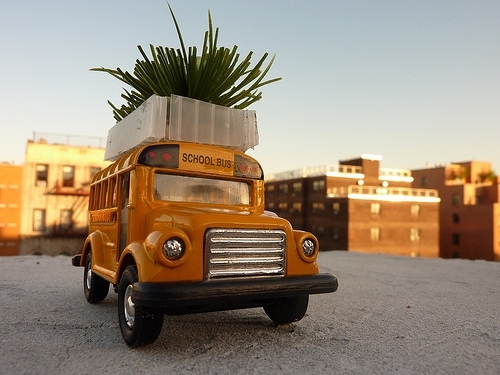 Bus Roots is the latest in a series of roving or nomadic argicultural projects developed by urban dwellers. For example, New York City agriculturalists can pluck weeds from Wicked Delicate’s Truck Farm, a tiny edible garden on the back of a Dodge pickup truck that can be seen driving around South Brooklyn.